A co-worker turned me on to Have’a Corn Chips close to 15 years ago, and I’m still not sure if I want to thank him or smack him. These chips are so delicious and addictive that I usually end up eating the entire bag in one sitting, followed by the obligatory guilt trip. I would be hesitant to write about them on this blog were it not for the fact that, before the recriminations begin…swoooon. 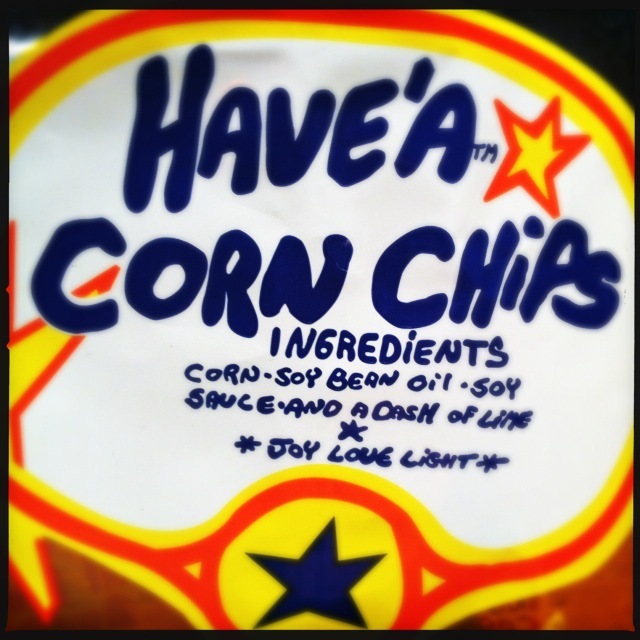 The formula is deceptively simple: corn, soybean oil, soy sauce and a dash of lime. Diabolical! It’s a potent combination of crunchy/salty with a dose of umami that mere mortals are helpless to resist. And I’m convinced that the company hired psychologists to design the packaging. At 4 oz., the bag is less than half the size of a standard bag of tortilla chips, but double the size of a large single serving bag of Doritos. After you eat half the bag, you think, “Well, there’s only a single serving left. Might as well just eat that too.” Have’a Chips should really change their name to Have’a Bag. Then there’s the mystery. 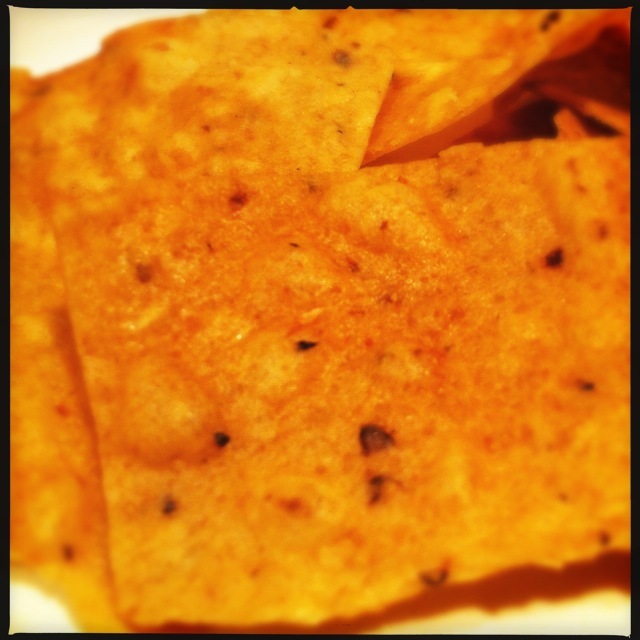 I have been told by more than one person over the years that Have’a Chips are made by Hare Krishna monks (a myth, according to this article), and the company does not have a website or any social media presence that I can find (the Have’a Corn Chips Facebook page was created by a fan and hasn’t been updated since 2013). Their operation is as murky as their bag is clear, but since I love a good mystery as much as I love a good chip, I’m content to remain in the dark. Speaking of which, I’ve been known to take every bag of Have’a Chips off the shelf at the market to scrutinize them for the one with the darkest chips (dark = soy sauce). A Have’a Chips addict has no shame! Except when it comes to punctuation. The apostrophe in the name of these chips is enough to drive a grammarian crackers, but it remains as much a mystery as the company itself. 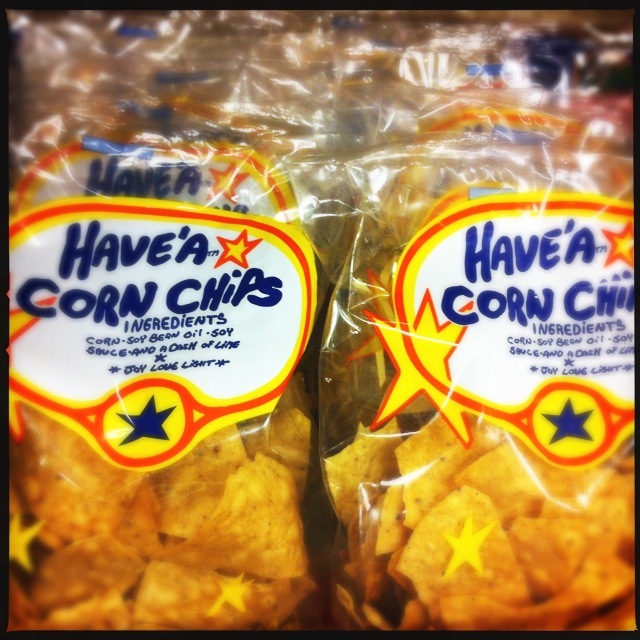 Have’a Chips are available at Whole Foods, Sprouts, and many natural foods store. They can also be purchased online at Amazon. I’ve always wondered about those but have never tried them. Now I must!